On January 8, 2018, toymaker VTech agreed to pay $650,000 to the Federal Trade Commission. Secretly collecting and failing to protect the private information of roughly three million children. The settlement stems from a 2015 data breach that exposed the depth of VTech’s privacy violations. Stolen data included children’s names, parents’ names, dates of birth, physical addresses, and answers to security questions. Child identity theft is a growing problem. Many assume identity theft is an adult issue, yet nothing can be further from the truth. While many of these crimes (60 percent)1 are committed by someone close to the victim, synthetic identity theft – where hackers steal and combine real data with fake data – is a concern as well. In this post, we’ll review six ways to teach effective internet safety so you can protect your child from identity theft. Start the conversation early and often. Set clear rules and expectations for internet safety and usage. Thoroughly explain all risks, including data theft, online predators, and inappropriate content. Have an open line of communication and encourage your child to come to you with any suspicious or inappropriate content. Being transparent and open with your child will make it easier for them to understand the risks and come to you with problems. When appropriate, limit the amount of information your child has access to, including social security numbers, passwords, and account numbers. Encourage your child to create an alias with fictitious information for non-vital accounts (ex: social media). 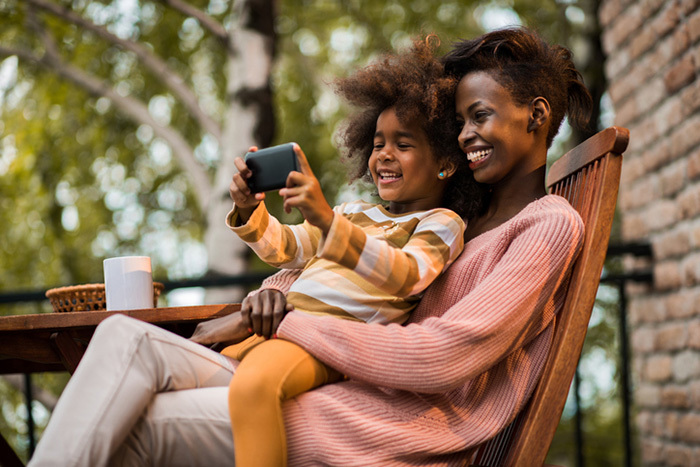 Be clear that your child is not to share any information – even last name, phone numbers, or physical addresses – without explicit parental consent. Additionally, communicate that screennames and usernames should not be associated with their real name. Get a reliable anti-virus software installed on your computer and mobile devices. Be wary of downloading random mobile apps – many can contain malicious malware. Encourage your child to avoid using public wi-fi to login to accounts. If using a public wi-fi network is absolutely necessary, make sure a virtual private network (VPN) is installed on their devices to ensure data is transferred securely. Be wary of clicking hyperlinks, even if they’re sent through friends. Many hackers have used popular online quizzes to gain unauthorized access to social media accounts. An additional habit that is good for your child to develop is always locking a device when it is not in use, especially with mobile phones, and above all, to not leave devices unattended. Create strong, unique passwords for each account and make sure that you change them regularly. If your account gets hacked, frequent changes will prevent continued access. Instead of making your child remember each password, use a password manager to store them. In addition to unique passwords, encourage your child to use two-factor authentication for an extra layer of security. Your child should never, under any circumstances, talk to strangers on the internet. Make sure your child understands the risks, including scammers or other online predators. Depending on your child’s age, it may be necessary to monitor their activity. Be sure to set-up kid-friendly search engines and block inappropriate websites to prevent your child from accidently stumbling upon risky websites. Additionally, try demonstrating suspicious content to your child so she knows which content to avoid. Teach your child the importance of being a responsible Internet citizen. The internet never forgets – encourage your child to avoid behavior that he would not do in person. Above all, remember cybersecurity is a shared responsibility. Be patient and understanding with your child. If you allow an open and frequent line of communication, your child will have a solid foundation for upholding strong internet safety methods. Grant, Kelli B. “Identity theft isn't just an adult problem. Kids are victims, too,” CNBC, April 24, 2018, https://www.cnbc.com/2018/04/24/child-identity-theft-is-a-growing-and-expensive-problem.html.